NEW VW BETTLE IS ONE OF THEM. 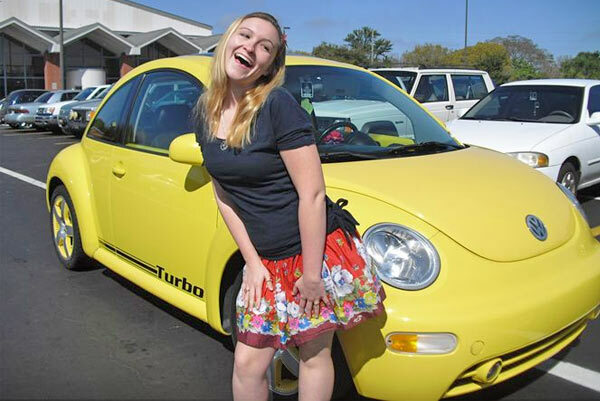 Its design, practicality, size and price, make the new Beetle, one of the favorite cars for women. Gone are the days when women loved to drive boring minivans, according to a study made by TrueCar.com. In particular, young women like practical cars, with great style, good interior space and affordable prices. The most popular model among youngest girls, is the Volkswagen New Beetle, which charming design is irresistible for them. Those women who have active lifestyles opt for crossovers like the Nissan Rogue. Hyundai has distinguished itself by offering great value cars and the Tucson is an example of this. Convertibles, such as the Volkswagen Eos, are also very attractive to girls. Besides price, safety is another priority, for that reason the Volvo S40 is very popular among the female market. Compact SUVs have also called the attention of women, and a good choice for them, is the Honda CR-V, which is safe, reliable and made to last long. The qualities and features of the Kia Sportage, led to KIA to join the list of favorites vehicles for women. In the SUV segment, is the Toyota RAV4, which offers a wider space, major safety and higher quality. Closing the favorite women cars group, was ranked the Nissan Sentra, a car with a refined style, which its stronger point, is economy in every way. In conclusion, we can say women prefer small and practical SUVs over sedan vehicles.